This may be my favorite layout of 2014 so far. 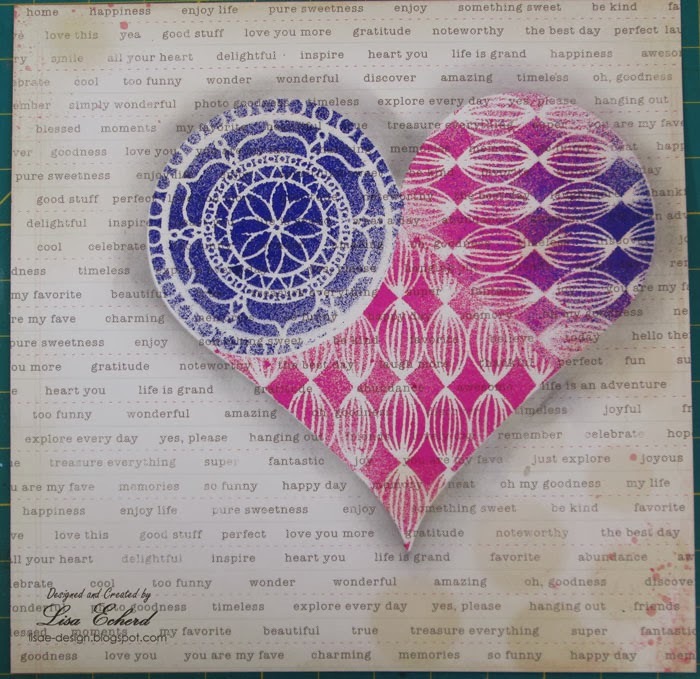 During a LOAD challenge where we were asked to have someone else make decisions about our scrapbooking, my husband looked over my Pinterest board and picked this layout from Sarah Webb that he liked because he particularly liked the word background. I spotted this background paper at A Cherry on Top. It is from Crate Paper's Flea Market collection so I got a piece to make a special page. I'm continuing MISTical March with stenciling on the background. 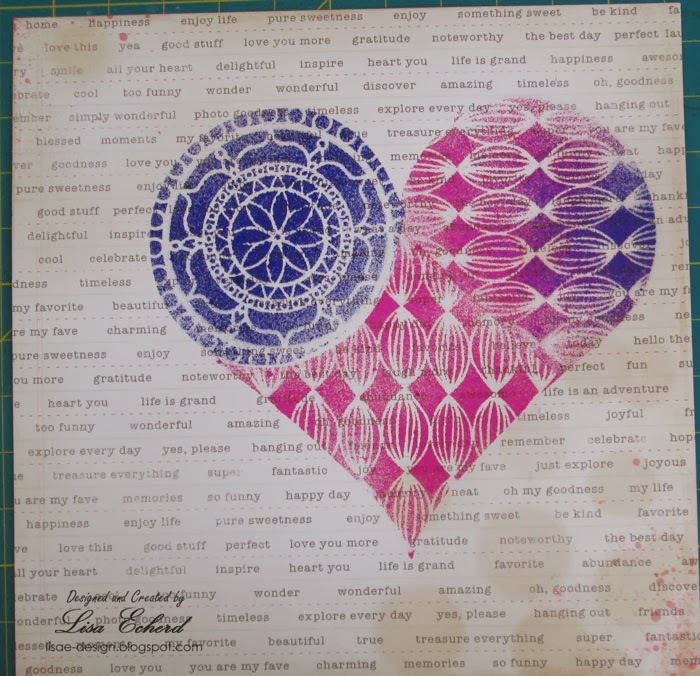 The heart is stenciled using some new Crafter's Workshop 2014 stencils - Rosetta and Onion Skin - in a mask I cut from the Cricut. The mists are Dylusions. What really made this pop was the shading. Here is a before and after. 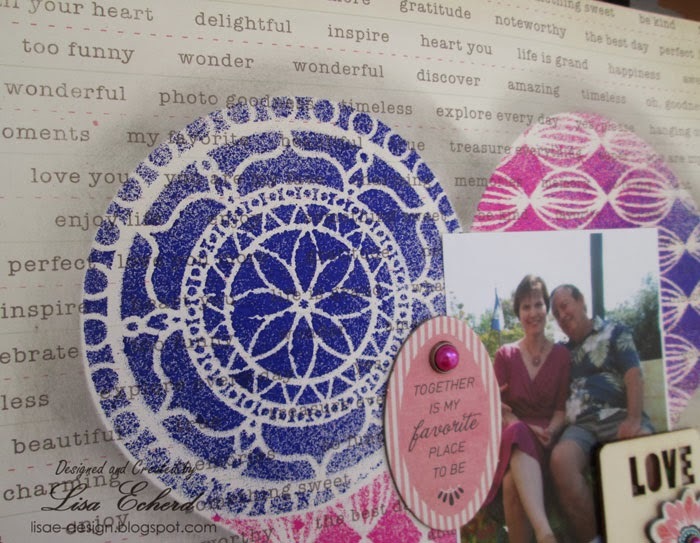 The shading is just some Stampin' Up! Basic Grey ink. The printed chipboard is from Basic Grey's Spice Market collection. 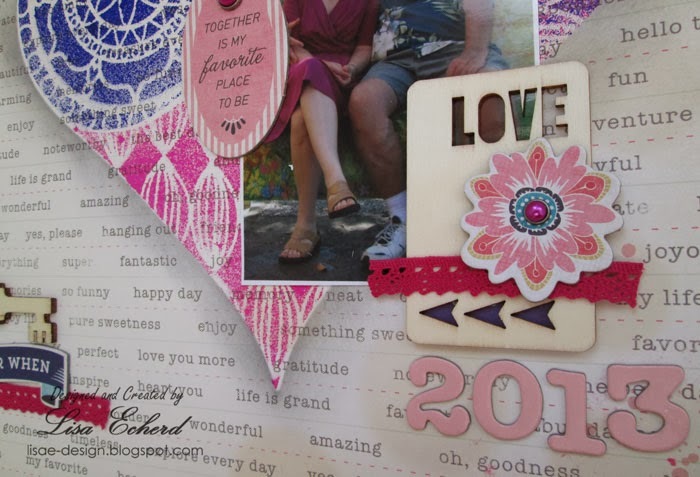 There is a lot of pink in the chipboard and not so much in the papers I selected from the collection so I figured I could spare some before diving into that new collection. The wood veneer LOVE piece is Amy Tan and the little key is from Hobby Lobby in the crafting section. Such a pretty layout, I cannot believe the difference the shading made with your gorgeous heart! Oh my goodness - that is gorgeous! I definitely agree with all the above statements. Boy, what a difference that gray ink makes. Just gorgeous! Wonderful layout - very very clever! I love the shading around the heart. I also love that your husband picked out the elements. What a beautiful page! And that your husband helped by picking out the background paper.. is just so fun. When I saw the photo of your layout, I initially thought that you made that heart as a separate embellishment. It looks absolutely fantastic! I cannot believe the difference that was made by adding that grey ink around the edges of the mask. Wonderful! I also wanted to say that it was just so nice to share LOAD with you in February, I enjoyed seeing your layouts pop up in my feed, and I hope that you join us again!